Buy Prewett's Organic Chicory Coffee 100g in the UK from our online shop or directly from our independent Scottish store. Prewett’s Organic Instant Chicory is made from the root of the chicory plant, which has been grown without the use of artificial chemicals. Prewett’s Organic Instant Chicory is made from the root of the chicory plant, which has been grown without the use of artificial chemicals. The plant is carefully cut, split, dried and roasted using processes which have been certified to ensure that your instant chicory drink is free from chemicals. 100% soluble solids of roasted organic chicory plant. 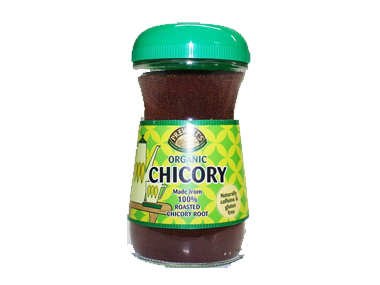 Did you know that chicory root has one of the highest concentrations of inulin? We sell real Prewett's and other Coffee Substitutes directly from our shop in Scotland and online throughout the UK. View more products from Prewett's. Where can you buy real Chicory Coffee 100g safely online? If you are wondering where you can buy Prewett's Organic Chicory Coffee 100g safely online in the UK, then shop with us. Chicory Coffee 100g - Prewett's Organic Chicory Coffee 100g in Coffee Substitutes and Drinks.